Since 2005, Jolinaiko Eco Tours has been visiting Atsiekpoe, a small village on the green banks of the Volta river, in the Volta Region in Ghana. Atsiekpoe village (its name meaning “Home of the cashew tree”, pronounced as "a-tjémpe") is on the opposite river bank from the villages of Aveyime and Battor. The location is quite unique: you can get there in a one and a half hour drive from the hectic capital Accra, after which you find yourself in a peaceful place surrounded by beautiful nature. 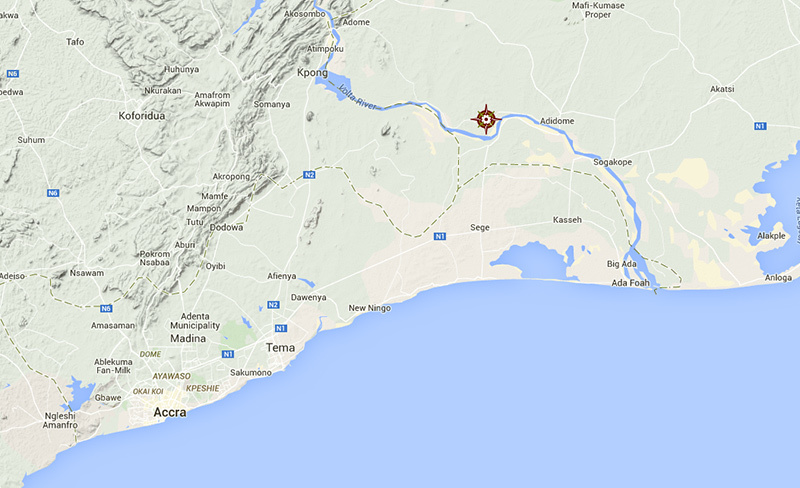 To get to Atsiekpoe from Aveyime, you need to cross the Volta river by ferry-canoe. Local life is very much centered around the river where local fishermen prepare their boats and nets, children play and swim, and women do their laundry. The village consists largely of termite clay houses with thatched roofs. The main economical activities are farming (cassava, maize, peanuts), fishing (tilapia and shrimps) and trading. Craftwork is another important source of livelihood. The local people weave baskets and mats from palm branches. And the blacksmith follows a century-old process in the production of iron tools. The Cashew Village Lodge, built by Jolinaiko Eco Tours, is situated right on the riverbank, offering a great view and a welcoming breeze. The lodge consists of two mud-brick/termite clay buildings with thatched roofs offering five basic guestrooms. There is a simple bathhouse (bucket shower), self-composting toilet, local-style kitchen and a summer hut at the waterfront. The work on the lodge has not been completed yet. Finishing touches are made on painting, management and landscaping of the compound. A pricelist will soon be available but calculate roughly 25GhC (€ 12,50) for an overnight stay, including dinner and breakfast. During your stay at the Cashew Village Lodge, you can take part in various 'community experiences' which are organized by the villagers. More photos of Atsiekpoe and the Cashew Village Lodge can be found in our photo album.